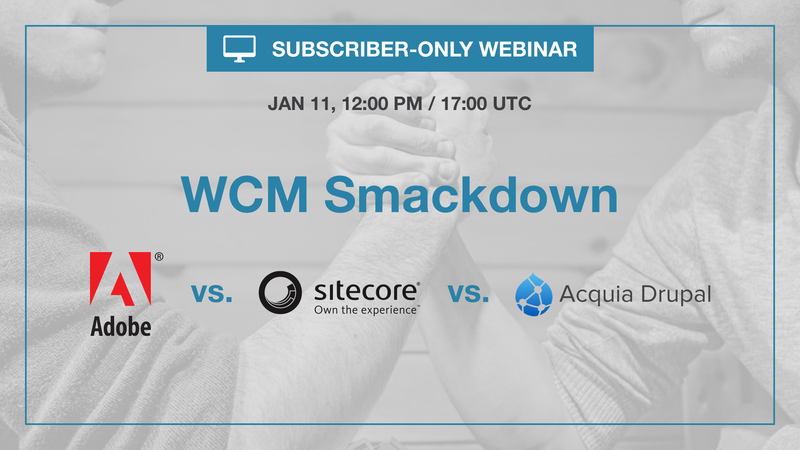 The past few years have seen the universal decline of big established Enterprise Content Management (ECM) players when it comes to Web Content & Experience Management (WCM). In their place has arisen a new set of alternative vendors offering alluring and feature-rich — yet complex and expensive — WCM offerings. Perhaps most prominent among these are three big global players: Adobe, Sitecore, and Acquia. On the surface, they purport to provide a similar set of highly customizable and personalized web experiences for your customers and prospects. If you send the same checklist RFP to all three, you’ll find them ticking mostly the same boxes..
However….things change when you get underneath the surface. Join RSG founder Tony Byrne as he outlines key differences in licensing, architecture, go-to-market, and scope among these three players. Even more intriguingly, Tony will outline the significant challenges and disappointments customers have experienced with each of them. Busy digital leaders don’t have time for vendor hype and marketplace myths. Join your fellow RSG subscribers and get the real story.